The Anglia In Bloom judges visited Leighton-Linslade on Thursday to once again assess floral displays, community involvement and environmental commitment and responsibility. The three-and-a-half hour tour was packed with varied projects and the town’s In Bloom chairman Sue Commons said it would have left the judges in no doubt as to the commitment of so many individuals and groups to the In Bloom campaign. These included two community gardens, one at Regents Street and one in Pages Park, a visit to Weston Avenue Allotments to show the increasing demand for plots and enthusiasm for growing own produce and a buggy ride around Tiddenfoot Waterside Park to show the numerous conservation projects which are carried out by the active volunteer group. 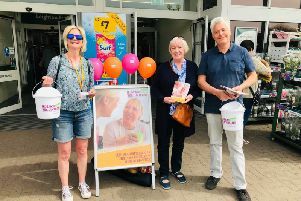 Sue said: “It is always heartening when young people take a pride in their community and environment and this was admirably shown by the involvement of numerous young people in the campaign. Sue added that so many organisations support and work tirelessly for the campaign, including South Beds Friends of the Earth who have many projects in the town. The judges were shown the hard work done at Mentmore Memorial Gardens, particularly this year to commemorate the end of the Seoond World War, and the biodiversity project along the banks of Clipstone Brook. Sue said: “LBFirst support the work of In Bloom and a number of businesses have begun to be actively involved in the campaign. “Some have displayed hanging baskets outside their premises put together by lower schools and Brownie groups. “Touch of Class in Bridge Street has developed its back garden to become a bee friendly haven and provide pleasure for its customers. “The Old Cedarians Masonic Lodge continues to maintain the floral display around the Flypast monument. “Ladies of the knitting group decorated the entrance to Peacock Mews with a very impressive display of knitted flowers and other splendid objects. “All this is set against the floral displays and shrub beds maintained by the town council. This includes the always popular Cottage Garden, maintained by Leighton Buzzard Garden Centre, on West Street, the floral troughs on the town river bridge and many other places.